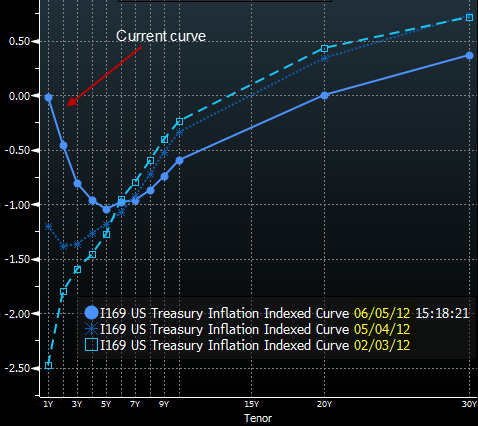 The US inflation indexed treasury curve (TIPS curve) has inverted sharply in the short end. The one-year TIPS yield went from negative 2.5% to zero in a matter of four months. The one-year treasury (nominal) yield on the other hand has held fairly steady near zero (between 12bp and 20bp over the past 4 months). That means that the market is now pricing near zero percent inflation over the next year (down from over 2.6% expected just 4 months ago!) - as near-term inflation expectations collapse. We haven't seen this since 2009. One could argue that this is a positive development for the US consumer because it could mean price stability. However this move in TIPS certainly raises the risk of near-term deflation, driven by weak demand growth. And deflation is notoriously difficult to get under control. This feels (though only in the near term) a bit like Japan, a nation quite familiar with zero to negative inflation expectations.